Hearing loss can be a huge complication for individuals and hearing aids are typically the answer for those with minor to severe hearing loss. Advancements in hearing aid technology are occurring everyday to provide benefits in people's lives especially with relationships at home, social lives and group activities. Despite the positive benefits of hearing aids and the fact that 20 percent of Americans have hearing loss impairing communication abilities, only one in seven Americans suffering from hearing loss uses a hearing aid . Researchers at Johns Hopkins University are studying this phenomena and in an effort to increase both public awareness and usage of hearing aids. With both technology and usage of hearing aids likely to increase in the future, researchers can be assisted by Federal and State R&D tax credit. The impact of hearing loss on individuals cannot solely be measured in decibels; the real impact is the overall experience of how a hearing loss patient deals with the ailment. Multiple studies have found that for both the individual with hearing loss and their significant other, there are higher rates of depression, anxiety, and other psychosocial disorders when not using a hearing aid. Additionally, hearing loss is also associated with decreased social/emotional communication and cognitive function in addition to increased depression for subjects who were unaided in comparison to those with hearing aids. Recently, Dr. Frank Lin and his associates at Johns Hopkins University found a link between hearing loss and the development of dementia. The higher degree of hearing loss the more likely one would be to develop dementia. As a result of these adverse effects associated with hearing loss, hearing aids and cochlear implants have been created to reverse this trend. A cochlear implant is an electronic hearing device that is designed to produce useful hearing sensations to a person with severe to profound nerve deafness by electrically stimulating nerves inside the inner ear. The implants consist of two components, an externally worn microphone sound processor and transmitter system and an implanted receiver/ electrode system. Cochlear implants receive sound from the outside environment, process it, and send small electrical currents near the auditory nerve. Unlike a hearing aid, the cochlear implants do the work of the damaged parts of the inner ear instead of simply making things sound louder. These electrical currents activate the nerve and in turn send signals to the brain which are processed as sound causing the brain to learn how to "hear" them. There are numerous benefits of cochlear implants; including making patients capable of understanding speech, making telephone calls, watching television, enjoying music, and hearing better than if the patient were using a hearing aid. 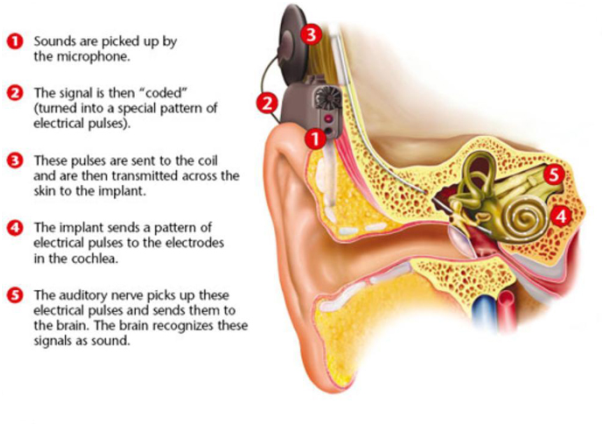 Figure 1 below is a diagram of a cochlear implant and the different pieces involved in the process. The first hearing aids were created in the 17th and 18th century and were commonly hearing aid "trumpets" based on the idea that one end could be wide and gather sound which would be then transmitted to the other narrow side in order to direct amplified sound to the ear. In the 19th century, efforts to conceal hearing aids began with decorative accessories that were integrated into collars, head wear, clothing, and hairstyles. With the advent of electricity in the early 20th, century a new generation of hearing aids that electronically amplified sound revolutionized the technology and as batteries became smaller which in turn made hearing aids smaller. Around the same time the transistor was invented which both increased effectiveness of electronic hearing aids but also decreased the size drastically. 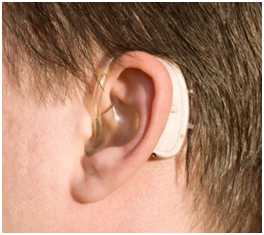 Since the turn of the 20th century much more advanced and efficient hearing aids have been created. Different hearing aids have different features that are beneficial to the user and no single hearing aid is right for every individual with hearing loss. Digital hearing aids for example have, noise reduction, directional microphones, feedback cancellation, multiple lifestyle programs, automatic programs and more. 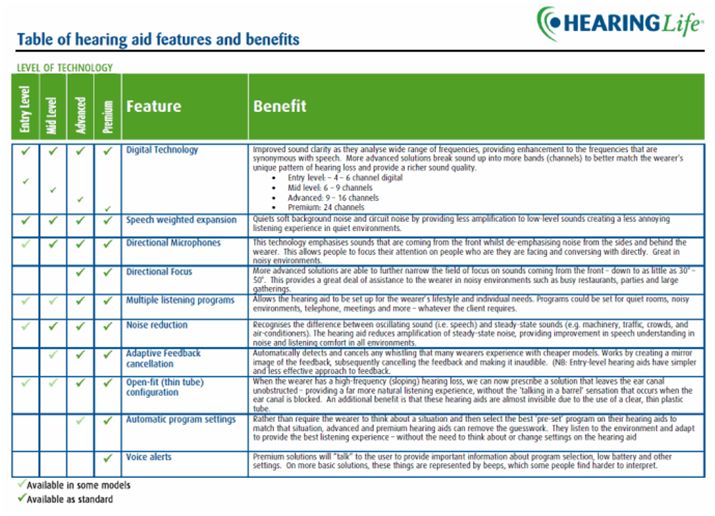 The benefits of hearing aid features are described below in Figure 2. Behind the ear hearing aids are the most powerful hearing aid style that is available and is typically for those with severe to profound hearing loss. These devices are definitely the most appropriate choice for children because only the ear mold has to be replaced as the child grows and not the entire device. They have the largest battery size and are the most durable causing repairs to be much less frequent. These devices were invented in the 1960s and are still used frequently today. Figure 3 below pictures a behind the ear hearing aid. In the ear hearing aids are also known as custom hearing aids because they are individually manufactured to fit a person's ear. They are suitable for those with mild to severe hearing loss and the size in addition to visibility depends on the shape of the individual's ear canal. Figure 4 below depicts an in the ear hearing aid. 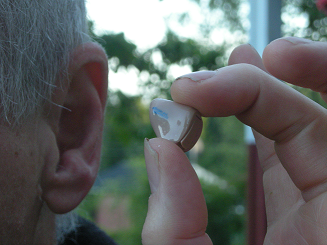 Typical hearing aids are designed to amplify sound and allow for an individual to hear better. In some cases there are individuals who have hearing loss in only one ear and in this situation, a conventional hearing aid would not work. The CROS hearing aid technology by Phonak is composed of a transmitting system that would be worn on the bad ear and typically a behind the ear hearing aid on the good ear. The CROS system transmits the sound that goes to the bad ear over to the good ear in order to increase sound perception. The transmitter has a 2 millisecond delay in order to "trick" your brain into thinking that it is hearing on the side of the bad ear. The technique works because in normal ears there is a 2 millisecond delay in between your right and left ears sound processing. 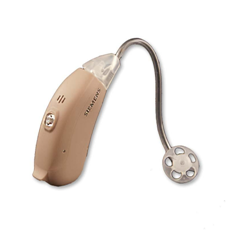 The CROS hearing aid has been a significant advancement in hearing aid technology. Within the past few years advancements in hearing aid technology have been rapid, from completely invisible hearing aids to hearing aids that are synced with Bluetooth, to apps that can control your hearing aid, innovation is being made. The progress in the field is remarkable and provides huge benefits for those in need of hearing assistance. The Lyric, the Personal Sound Amplifier Product and the MiniTek are among some of the most cutting edge devices out there. The Lyric hearing aid also by Phonak, is the world's first completely invisible extended wear hearing device that delivers natural sound. Sitting one sixth of an inch above the eardrum, the device has a much longer battery life than traditional hearing aids and can be left in overnight. 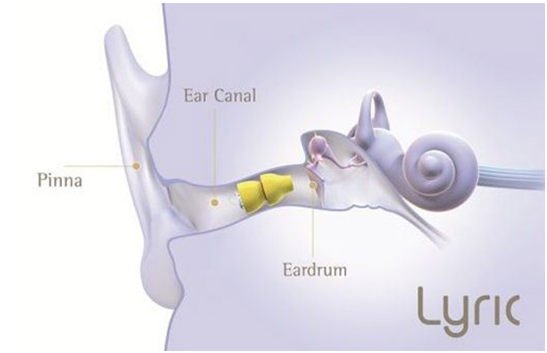 Lyric requires no surgery and simply requires the doctor to place it in the patient's ear. With a spongy contoured material coat and antimicrobial silver ions to prevent infection, the device can last an extensive period of time because it prevents the entrapment of moisture. The life of the Lyric is as long as the battery lifetime which ranges from two to four months after insertion as opposed to the typical hearing aid battery which lasts only about a week. Todd Ricketts, a professor at Vanderbilt University Medical Center, says "Lyric is best suited for patients with mild to moderate hearing loss". For those individuals meeting that requirement, the benefits are significant, Lyric is hassle free and can be used when sleeping, showering, exercising, driving, or attending entertainment events in addition to being invisible, a huge concern for many hearing aid users. Figure 5 illustrates how the Lyric works. P.S.A.P hearing aids are designed to amplify sounds in a recreational environment. Contrasting with normal hearing aids, P.S.A.P. 's are exempt from FDA oversight and can be sold as electronic devices over the counter. Sound World Solutions Co. has developed a P.S.A.P that utilizes the latest in wireless technology, offering promising alternatives for those with hearing loss. The product is thousands of dollars cheaper than most digital hearing aids and still has many of the same features that high-end hearing aids have, including 16 channels to process sound, directional microphones, feedback insulation, and noise reduction. Additionally, the product has one capability that most hearing aids on the market do not possess; Sound World Solutions packages the product with software that enables consumers to program the hearing aid via Bluetooth. While there are limitations on this device, which behaves as a cross between a Bluetooth headset and a hearing aid, it provides a direction for hearing aid technology to go in that is exciting for the field. Figure 6 below depicts man using the app in conjunction with a hearing aid. MiniTek is a remote application for the iPhone which delivers universal access to the following hearing aids, Pure Micon, Motion, Nitro BTE, Siemens Life, Aquaris, and Insio 7mi/5 mi. The device wirelessly connects all essential audio devices such as phones, TV's, and MP3 players in addition to smart phone apps like Pandora Radio, Google Maps, driving instructions, and FaceTime video calls to your hearing aid. In 2012 MiniTek won the Best of Bluetooth Next and Fan Favorite awards at the Consumer Electronics show. The device has one small stylish remote device which transmits audio to both ears and is the only wireless solution that supports a completely in canal device. It allows for significant increases in hearing capabilities and brings everything the user could need to their hearing aid all at once. 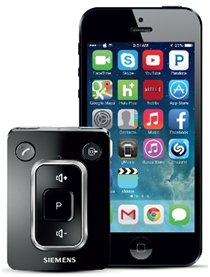 Figure 7 illustrates the sleek design of the remote alongside one of the compatible aids. Modern hearing aids not only have increased speech noise but background noise as well. As a result of this when in high noise settings such as parties it is difficult for a hearing aid user to hear even with the device. Dr. Lem Wang, at Ohio State University has done extensive research on this problem. The research team led by Dr. Wang discovered a method to break down sound into two units, speech or noise, and then discard the noise. The results have been remarkable for those who have trialed the new product and it has many people in the industry very excited although the final version will not be out for about 10 years. While hearing aids can be very helpful tools, they are not like glasses in the sense that they bring hearing completely back to normal. Typically hearing aids allow for amplification of frequencies up to about 5 kHz while people with normal hearing can hear from about 15 kHz to 20 kHz. Researchers at the University of Cambridge in the UK, in 2012, developed software which extends the hearing capacity of a hearing aid up to 10 kHz making them much more effective. 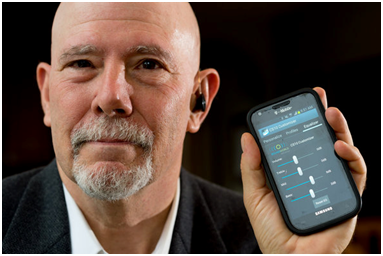 In 2011, Boston University professor Gerald Kidd developed the idea for a visually guided hearing aid(VHGA). This device is developed for a loud environment such as a concert, party, etc and is designed to assist 20 percent of Americans age 12 or older that have hearing loss severe enough to make communication difficult. For these individuals typical hearing aids are not as helpful in noisy environments. Hearing aids currently being developed use the wearer's head movements while guiding a microphone to pick up the sound but head movements tend to not be synchronized well with attention. The VGHA addresses this problem by using eye movement in order to tune into sounds "like an acoustic flashlight that you're shining on what you want to listen to" says Kidd . Researchers at the National Center for Rehabilitative Auditory Research tested VGHAs and found astounding results; The test patient was able to differentiate between several voices across the room which is an amazing feat. Although the product is still being developed a lot of excitement has been generated and it will surely be researched in years to come. Hearing aids are essential for those who have minor to severe hearing losses. While these devices tend to be very successful, their shortcoming is that they do not completely restore hearing and it is still difficult to hear in a noisy environments. With the research being done commercially and at universities in America the R&D federal tax credit can help aid researchers further develop hearing aid technologies.